Children who are taking ADHD medications have a higher than thier normal blood pressure. A large number of children exprience significant weight loss. One mother described her worries about her son looking like a concentration camp survivor at a special education team meeting that I attended. She said that she had also voiced her concern to the doctor. It was not until I called that doctor and inquired that a medication change occured. Studies in Guatemala and Honduras linked lower IQ, stunting of growth and brain shrinkage to children not receiving proper nutrition. Lower IQ, studening of growth and brain shrinkage have been noted a clinical side effects in individuals taking amphetamines, the chief ingredient in Ritalin, Concerta, Adderal and other ADHD drugs. The States now has more people in prison than any other country in the world. 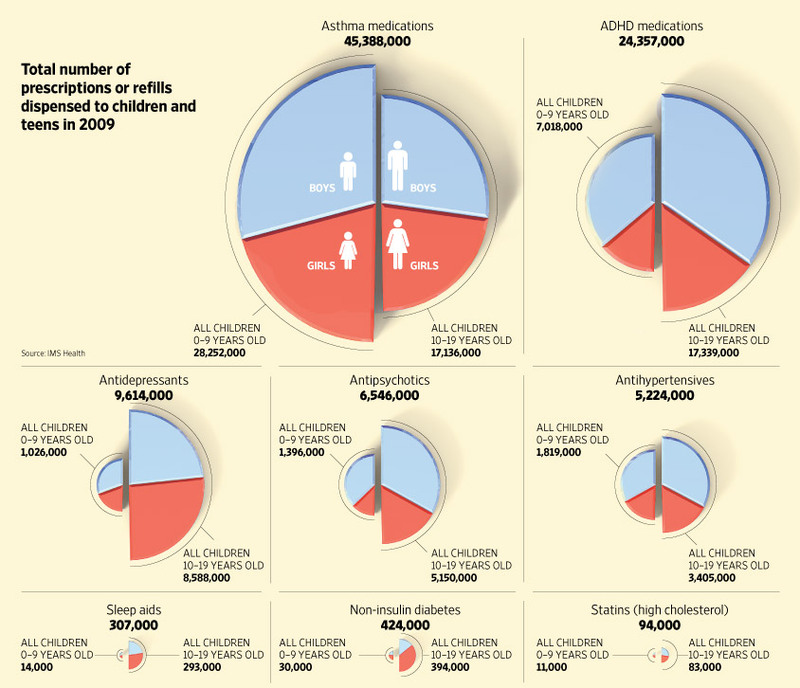 The United States had continued to fall behind in education with the advantage of ADHD Meds. In Japan, China, Greece, Saudi Arabia, Kuwait and numerous other countries were children are not prescribed ADHD druges test scores are much higher in math and science. Most medications that could be prescribed to children on a chronic basis haven't been tested specifically in kids, says Danny Benjamin, a Duke University pediatrics professor. And older drugs rarely get examined, since pharmaceutical firms have little incentive to test medicines once they are no longer under patent protection. Long-term effects of drugs in kids are almost never known, since pediatric studies, like those in adults, tend to be relatively short. "We know we're making errors in dosing and safety," says Dr. Benjamin, who is leading a new National Institutes of Health initiative to study drugs in children. He suggests that parents should do as much research as they can to understand the evidence for the medicine, confirm the diagnosis, and identify side effects. Among the places to check: drug labels and other resources on the FDA's website, published research at www.pubmed.gov, and clinical guidelines from groups like the American Academy of Pediatrics. After a drug is prescribed, children must be closely monitored, doctors say. They may not recognize or communicate a possible side effect, or whether their symptoms are improving. They also don't always follow prescription instructions. Children given Ritalin to control hyperactivity could be permanently brain damaged, it was claimed yesterday. Research suggests the controversial 'chemical cosh' drug raises the risk of depression and anxiety in adulthood. Ritalin alters the brain's chemical composition so that it has a lasting effect on mental health, US scientists believe. Because these changes take place while a child's brain is growing, they could cause irreversible damage. The findings will alarm parents using the drug to control a child's attention deficit hyperactivity disorder (ADHD). British GPs dispensed a record 254,000 Ritalin prescriptions last year, up from 208,500 in 2001. One in 20 children is said to have ADHD, which makes them boisterous and unfocused. 'It is vitally important we evaluate the long-term effects of these drugs,' said Dr Nora Volkow, director of the US National Institute on Drug Abuse. Although American studies involved laboratory rats, the doses given were comparable to those used on children. In one test, giving Ritalin to young, healthy rats increased the presence of certain chemicals linked to depression in adults. Asecond study found higher levels of stress hormones and anxietylike behaviours. Novartis, the company which makes Ritalin, has insisted there was no clinical link to depression or anxiety disorders.